We have all been programmed by life to believe that stress, anxiety, conflict, & illness comes from out there somewhere. The kids & work stress us out & the boss makes us angry. We see someone with a bad cold & everyone catches it. That one guy that didn't get it must have good genes. All truly grand illusions. Our minds are so gullible & stuck in beliefs systems & being right that they will make us sick. Dr Hawkins says in the film "there is no such thing as an illness without an associated belief system". Beliefs are 1 of the 10 Principal Elements for wellbeing. Course Structure: Lectures consists of videos, film, music videos, an audio book and a student guide. Simply view 16 hours of entertaining and educational lectures then do the homework which consists of contemplative ten minute per day set of exercises for 90 days. That's it. 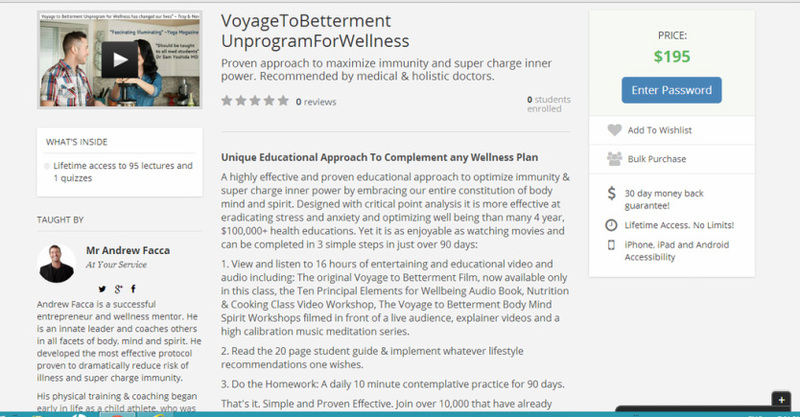 The wellness class contains all the information, videos & all the instructions necessary to customize an approach to optimize wellbeing and super charge immunity. The course supports students freedom to eat, exercise, believe & live as they wish. The course is the only way to view the Voyage to Betterment film now & helps viewers to see it first to believe it. This Online Course is updated & includes a discovery by a woman who is now 94 & sharp as a whip. Students will learn how to implement this knowledge decades ahead of its time to maximize immunity. It will likely change the face of nutrition & medicine. David R Hawkins MD said that it was an important discovery that corroborated his 45 years of clinical experience. Designed With Critical Point Analysis so the least amount of effort has the most impact this class may have a greater impact at optimizing wellbeing then spending $100,000 & years in school somewhere else. No homework nor hours a day in class. Students simply view the online lectures on their phones, pads or laptops then do the contemplative 10 minute a day exercises for 90 days. That's it. Simple & Proven Effective. 10 minutes a day is about the same time it takes to brush our teeth. If we play hooky or miss a day no biggie. Our teeth don't fall out if we miss a day of brushing. We just try not to miss 2 days in a row as it leads to bad breath. Prior to making any changes to lifestyle seek the advice of your doctor.